O/o Inspector of Schools, Golaghat. 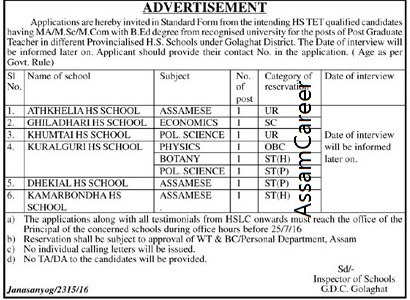 Applications are hereby invited in Standard Form from intending HS TET qualified candidates having MA/MSc/MCom with BEd Degree from recognized university for the post of Post Graduate Teacher in following Different provincialized HS Schools under under Golaghat District. How to apply: The applications along with all testimonials from HSLC onwards must reach the office of the Principal of the concerned schools during office hours before 25.07.2016.